Emission Control Systems – Air-Clear, LLC. Emission control systems can convert these contaminants into water vapor and carbon dioxide which may be safely released into the environment or recirculated. Particulate and gaseous emissions pose a threat to cardiovascular and lung health in humans and animals. This pollution can also have serious environmental repercussions as they increase ozone depletion. Regulatory agencies, such as the EPA have placed strict limitations on acceptable emission levels or amount of pollutants that can be released into the environment. In order to comply, many industries are now using emission control systems. Automotive, pharmaceutical, medical, microelectronic, bio-safe labs, and aerospace industries are just a few who employ these systems to decrease harmful byproducts. While the EPA sets a strict standard, state law dictating acceptable emissions varies. Many facilities employ continuous emissions monitoring systems to aid in the control and monitoring of harmful discharges for easy reporting to federal and state supervisory committees. A variety of systems for managing emissions from different sources have been developed. 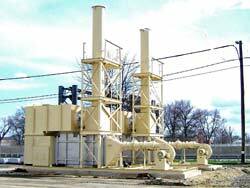 VOC abatement systems are popular as are air filtration systems. 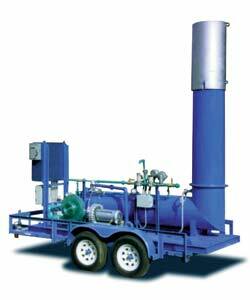 Industrial emission control often entails the installation of large equipment, though it is not necessarily complex. Wet scrubbers and air scrubbers involve the installation of pools or streams which attract and remove particulates from the air as do many other air filtration systems. Both catalytic and thermal oxidizers are used to break down pollutants and purify the air by heating the materials to extreme temperatures. Those systems using incendiary temperatures often use heat recovery systems to help offset the cost of operations. Contaminants caught by mist collectors and other such devices may also be recycled for reuse. In this way, the air pollution control industry benefits not only the environment and safety of workers but often the company as well. The type and level of emission control system required in each setting depends largely on the quantity and specific composition of an air stream. Systems may be as small as an automotive catalytic converter or a massive scrubber atop a smokestack. Early emissions control systems were simply add-on components that solved a particular emission need. While add-ons are still used today, products and factories often have built in emission control systems that have become a significant part of the combustion and manufacturing process. Emission Control Systems Emission control systems are devices that monitor and diminish harmful byproducts of combustion and other processes that, without these systems in place, would be released into the atmosphere. Industrial processes, such as combustion, emit unburned hydrocarbons, carbon monoxide and oxides of nitrogen and sulfur among other harmful pollutants.